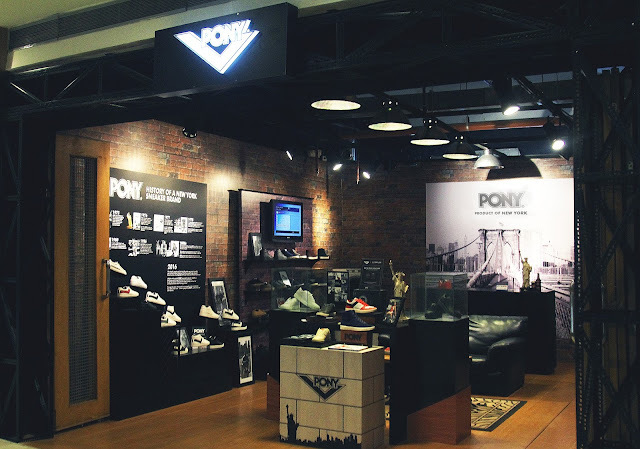 PONY Footwear launches its first ever Pop-Up store in TriNoma. In collaboration with Complex Lifestyle Store, PONY cops out the prime of all-American heritage and ultra-sleek urban sneakers. From handpicked retro-shoes hot off the Archive Collection to the latest releases of this season’s Updated Classics. The first ever PONY Pop-Up Store is NOW OPEN in TriNoma 2nd Floor (Across Taco Bell). Watch out for the best of New York’s shoe staples. Inspired by the grit of the Brooklyn streets and the edge of the new generation of New Yorkers. The latest in PONY’s hottest Updated Classics. Inspired by the grunge of New York’s streets- Exposed bricks, an industrial ceiling design, wood panels and a matte black colour theme- PONY’s Pop-Up store stays true to its Brooklyn roots. A modern interior with an edge- The underdog sneaker brand lives up to the rebellious spirit of the city that never sleeps. Last December 8, 2016 PONY celebrated the media launch of the Pop-Up Store. The NYC sneaker brand officially introduced the Return of The Icons with the complete Archive Line to press and guests alike. PONY boasts of the basketball-inspired pieces of the new collection. This includes everything from Top Star ’77, Pro-Model, Slamdunk and the iconic PONY City wings that was worn by NBA legend Spud Webb. The iconic PONY city wings that was worn by NBA legend Spud Webb. that were served during the event. This is also where the first half of the next set of Campus Ambassadors made their debut. Waf Al Hassawi from National University, Stephen Quizon from UP Diliman, Chelsea Manalo from De La Salle Araneta University and Sosy Orsini from Colegia De San Juan De Letran! Meet Nawaf Al Hassawi, representing National University. Meet Stephen Quizon, representing UP Diliman. Meet Chelsea Manalo, representing De La Salle Araneta University. Meet Sosy Orsini, representing Colegio De San Juan De Letran. PONY was inspired by the core elements of street culture: Blood-pumping music from DJ’s, Hip-Hop dance performances and authentic street-style. The afternoon started with awesome beats and tunes from Campus Ambassador and DJ Waf Al Hassawi- Hyping up the guests including one of the hottest EDM artists Bea Valera and celebrated actor Alex Medina. Hosted by one of the dopest sneaker youtubers in town- Ralph A.K.A Woohooligan. The program jumped right ahead into the introduction of the next generation of PONY Get Scouted campus ambassadors. This is after up and coming indie artist Craig A.K.A Graceson performed for the excited crowd. Bea Valera, one of the hottest EDM artists in the country, hangs out by the iconic PONY Citywings. from National University pumped up the afternoon with dope beats and tunes. Celebrated actor Alex Medina gamely talks about the underdog sneaker brand with the host, one of the hottest sneaker Youtubers, Ralph A.K.A Woohooligan. Up and coming indie artist Craig A.K.A Graceson performed for the excited crowd. Jason Fernandez, former Rivermaya vocalist and The Voice finalist, also amazed the crowd with classic OPM hits. One of GMA’s most celebrated young actresses and recording artists, Isabelle De Leon kept the spirits high with her epic performance. The event ended with a blood-pumping Pop N’ Lock number from one of the former PONY Get Scouted Campus Ambassadors- Frank Romuar and his crew- SDNC. A truly iconic afternoon that stayed true to the core values of PONY: All-American Heritage, Rich Athletic History and Rebellious Spirit. Jason Fernandez, former Rivermaya vocalist and The Voice finalist, showed off his amazing vocals during the program. One of GMA’s most celebrated young actress and recording artist Isabelle De Leon performs during the launch. Former PONY Get Scouted Campus Ambassador Frank Romuar from San Beda showed off epic Funk, Pop N’ Lock dance moves with his crew, SDNC. Meet the dancer of the pioneer batch of PONY Get Scouted Campus Ambassadors- Frank Romua from San Beda. Experience the prime of street-style with fresh sneaker picks- Get a closer look on the history of New York’s official sneakers with the PONY Info Graphic Wall that showcases the highlights of the underground sneaker’s rich history. Striking a nerve since 1972. The PONY store is now open for business. Hurry and check out the iconic styles from PONY’s Archive Line- The Pop-Up Store will be in TriNoma from November 2016 to February 2017 ONLY. The first half of the new generation of PONY Get Scouted Batch 2016-2017 Campus Ambassadors with PONY Executives: Mr.Charles Yu, Vice President for Gallop Ventures, Ms. Donna Santos, Marketing Manager and Ms.Donna Ganancial-Ayson, Concession and Merchandising Manager. Nawaf Al Hassawi from National University , Stephen Quizon from UP Diliman, Chelsea Manalo from De La Salle Araneta University and Sosy Orsini from Colegia De San Juan De Letran. Complex Lifestyle Store curates the best merchandise and ideas from a wide array of brands from footwear and apparel to accessories and integrates them into a single unique experience. We continue to redefine the boundaries of popular fashion and culture to deliver progressive solutions demanded by today's lifestyle. For the complete store listing check out www.complexlifestylestore.com .